Elapidae, whose members are known as elapids, is a family of venomous snakes characterized by hollow, permanently erect, relatively short fangs in the front of the mouth that channel venom into the prey. This proteroglyphic dentition, meaning "fixed front fangs," is a major distinguishing characteristic from the other major family of venomous snakes, Viperidae, whose venom delivery system involves two, long, hollow, venom-injecting fangs that fold back against the roof of the mouth when the mouth is closed (solenoglyphic dentition, or "movable front fangs") (Keogh 2004). Elapids are a diverse group of more than 300 species placed in about 60 genera (Keogh 2004), including species that live in terrestrial, arboreal, and marine environments. Well-known members include cobras, mambas, coral snakes, death adders, and, in some taxonomies, sea snakes. Elapids are found in tropical and subtropical regions around the world, including the Americas, Africa, Asia, Australia, and the Indian and Pacific Oceans. Elapids add greatly to the diversity and wonder of nature. They also provide important ecological values as part of food chains, consuming small terrestrial vertebrates and even eels in the case of the partially marine sea kraits and fish, squid, and fish egg masses in the case of the fully marine sea snakes. Some elapids, such as king cobras and many coral snakes, even eat other snakes. However, despite their important functions, elapids often are feared, as this family also includes many of the world's most deadly snakes, such as the black mamba (Dendroaspis polylepis) and the inland taipan (Oxyuranus microlepidotus). Outwardly, terrestrial elapids look similar to the colubridae: Almost all have long and slender bodies with smooth scales, a head that is covered with large shields and not always distinct from the neck, and eyes with round pupils. In addition, their behavior is usually quite active and most are oviparous. There are exceptions to all these generalizations: For example, the death adders (Acanthophis) include short and fat, rough-scaled, very broad-headed, cat-eyed, live-bearing, sluggish ambush predators with partly fragmented head shields. Elapids range from small to large in size, from only 18 centimeters (7 inches) long (crowned snakes, Drysdalia, and the rare Fijian, Ogmodon vitianus) up to 6 meters (19.6 feet) in length (king cobra, Ophiophagus hannah). All elapids have a pair of proteroglyphous fangs that are used to inject venom from glands located towards the rear of the upper jaws. The fangs are the first two teeth on each maxillary bone. These teeth are enlarged and hollow, and usually only one is in place on each side at any time. The maxilla is intermediate in length and in mobility between typical colubrids (long, less mobile) and viperids (very short, highly mobile). When the mouth is closed, the fangs fit into grooved slots in the buccal floor; in the longest-fanged elapids (for example, Acanthophis, Oxyuranus) it is common for the fangs to pierce right through the intermandibular skin, which does not seem to endanger the snake. The fangs are usually below the front edge of the eye and are angled backwards; due to this construction, most elapids must actually bite in order to envenomate. This action is therefore not as quick as with the viperids, that can envenomate with only a quick, stabbing motion. Fangs are generally short, given that they cannot fold back as with viperids. Some elapids (Acanthophis, Oxyuranus, and especially Dendroaspis) have somewhat long fangs on quite mobile maxillae (the prefrontal and ectopterygoid contacts are nearly as close together as in viperids), and can therefore make very fast stabbing strikes like viperids. A few species are capable of spraying their venom from forward facing holes at the tips of their fangs as a means of defense. Elapids use their venom both to immobilize their prey and in self-defense. In the Western Hemisphere, elapids, in the form of diverse coral snakes, are found from the southern United States to South America, including Central America. In the Eastern Hemisphere, elapids are found in Africa (except Madagascar), southern Asia, and Australia (Keogh 2004). They also are found in the Pacific and Indian Oceans. Sea kraits inhabit coastal areas of southern Asia through Southeast Asia, Polynesia, and Melanesia, while sea snakes are found in warm waters around northern Australia, New Guinea, the Philippines, Indonesia, and all of Southeast Asia, as well as a few species in the Persian Gulf and some as far east as French Polynesia (Keogh 2004). The yellow-bellied sea snake, Pelamis platurus, is an open-water or pelagic species that has a range even beyond this, with the snake found off the east coast of Africa and off the west coast of North and Central America in the Pacific and Indian Oceans, and is the most widely distributed snake species in the world (Keogh 2004). Sea snakes are unknown in the Atlantic Ocean. Elapids occupy diverse habitats, from grassland, to rainforest, to desert, to savanna, and from terrestrial, to arboreal, to aquatic. Some elapids are strongly arboreal (African Pseudohaje and Dendroaspis, Australian Hoplocephalus), while many others are more or less specialized burrowers (for example, Ogmodon, Parapistocalamus, Simoselaps, Toxicocalamus, Vermicella) in either humid or arid environments. Ogmodon vitianus lives deep underground in Fifi (Keogh 2004). Sea kraits are partially marine, inhabiting coral reefs where they feed, but come onto beaches and rocks to rest and lay eggs, while sea snakes are fully marine (Keogh 2004). Sea snakes have adapted to a marine way of life in different ways and to various degrees. All have evolved paddle-like tails for swimming and the ability to excrete salt. Most also have laterally compressed bodies, ventral scales are much reduced in size, their nostrils are located dorsally (no internasal scales) and they give birth to live young (ovoviviparous). In general, they have the ability to respire through their skin; experiments with the yellow-bellied sea snake, Pelamis platurus, have shown that this species can satisfy about 20 percent of its oxygen requirements in this manner, allowing for prolonged dives. The sea kraits (Laticauda sp. ), are the least well-adapted to an aquatic life. They spend much of their time on land, where they lay their eggs. They have wide ventral scales, the tail is not as well-developed for swimming, and their nostrils are separated by internasal scales. All elapids are venomous and many are potentially deadly. The venom typically differs from that of vipers, with the elapid venom being a neurotoxic venom (nerve poison) that acts on the central nervous system, affecting heart function and breathing, while vipers primarily have hemotoxic and myotoxic venom that produces damage at the bite site, including necrosis of the tissue (Keogh 2004). The neurotoxic venoms of elapids are considered more dangerous than the mainly proteolytic viper venoms. Elapid members include the black mamba (Dendroaspis polylepis), a species many regard as the world's most dangerous snake, the inland taipan (Oxyuranus microlepidotus), which is the most venomous land snake, and Hydrophis belcheri, a sea snake and the most toxic venom of all snakes. While many elapids are active at night and at dusk, others are active foragers during the daytime (Keogh 2004). They also are diverse in diet. As with vipers, the main prey of elapids is small vertebrates, such as mice, rats, frogs, lizards, and birds. Other snakes, eggs, and fish are also prey. While some species have very generalized diets, many taxa have narrow prey preferences and correlated morphological specializations. 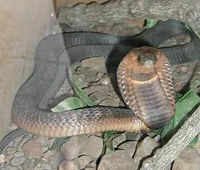 For example, the southern African Rinkhal's cobra, Hemachatus haemachatus, prefers toads. The partially marine sea kraits and the fully marine sea snakes obtain food from aquatic environments, with sea kraits specializing on eels and sea snakes feeding on fish and squid, and some eating only the egg masses of fishes (Keogh 2004). King cobras will eat other snakes, and many coral snakes specialize on other snakes (Keogh 2004). While most elapids are active foragers, some lay in wait, such as the Australian death adder (Acanthophis), which remains in position while undulating the yellowish-while, larva-like tip of its tail to lure prey (Keogh 2004). Most elapids lay eggs, including all coral snakes, mambas, kraits, and almost all cobras (Keogh 2004). Live-bearing is common in some groups, including sea snakes. Most elapids do not take care of their young or eggs (Keogh 2004). Keogh recognizes 60 genera and over 300 species of elapids. ITIS (2004) recognizes 61 genera and 231 species. The following is a list of genera according to ITIS (2004). Acalyptophis Boulenger, 1869 1 0 Spiny-headed sea snake Gulf of Thailand, South China sea, the Strait of Taiwan, and the coasts of Guangdong, Indonesia, Philippines, New Guinea, New Caledonia, Australia (Northern Territory, Queensland, Western Australia). Acanthophis Daudin, 1803 7 0 Death adders Australia, New Guinea, Indonesia (Seram, and Tanimbar). Aipysurus Lacépède, 1804 7 1 Olive sea snakes Timor Sea, South China Sea, Gulf of Thailand, and coasts of Australia (North Territory, Queensland, West Australia), New Caledonia, Loyalty Islands, southern New Guinea, Indonesia, western Malaysia, and Vietnam. Aspidelaps Fitzinger, 1843 2 4 Shieldnose cobras South Africa (Cape Province, Transvaal), Namibia, southern Angola, Botswana, Zimbabwe,Mozambique. Aspidomorphus Fitzinger, 1843 3 0 New Guinea. Astrotia Fischer, 1855 1 0 Stoke's sea snake Coastal areas from west India and Sri Lanka through Gulf of Thailand to China Sea, west Malaysia, Indonesia east to New Guinea, north and east coasts of Australia, Philippines. Austrelaps Worrell, 1963 3 0 Copperheads Australia (South Australia, New South Wales, Victoria, Tasmania). Boulengerina Dollo, 1886 2 1 Water cobras Cameroon, Gabon, Democratic Republic of the Congo, Congo, Central African Republic, Tanzania, Equatorial Guinea, Rwanda, Burundi, Zambia. Bungarus Daudin, 1803 12 4 Kraits India (incl. Andaman Island), Myanmar, Nepal, Vietnam, Afghanistan, Pakistan, Sri Lanka, Bangladesh, Cambodia, Indonesia (Java, Sumatra, Bali, Sulawesi), Peninsular Malaysia, Singapore, Taiwan, Thailand. Cacophis Günther, 1863 4 0 Rainforest crowned snakes Australia (New South Wales, Queensland). Calliophis Gray, 1834 8 11 Oriental coral snakes India, Bangladesh, Sri Lanka, Nepal, Indonesia, Cambodia, Malaysia, Singapore, Thailand, Burma, Brunei, Philippines, Vietnam, Laos, southern China, Japan (Ryukyu Islands), Taiwan. Demansia Gray, 1842 9 2 Whipsnakes New Guinea, continental Australia. Dendroaspis Schlegel, 1848 4 1 Mambas Kenya, Tanzania, Mozambique, Malawi, Zimbabwe, South Africa, Ghana, Togo, Benin, Nigeria, Cameroon, Guinea, Gabon, Principe (Gulf of Guinea), Central African Republic, Democratic Republic of the Congo, Congo, Uganda, Rwanda, Burundi, Equatorial Guinea, Angola, Sudan, Botswana, Burkina Faso, Eritrea, Senegal, Mali, Ethiopia, Ivory Coast, Namibia, Somalia, Swaziland, Zambia, Gambia, Guinea Bissau, Liberia, Ivory Coast, Sierra Leone. Denisonia Krefft, 1869 2 0 Ornamental snakes Central Queensland and central northern New South Wales, Australia. Drysdalia Worrell, 1961 3 0 Southeastern grass snakes Southern Australia (Western Australia, South Australia, Victoria, Tasmania, New South Wales). Echiopsis Fitzinger, 1843 1 0 Bardick Southern Australia (Western Australia, South Australia, Victoria, New South Wales). Elapognathus Boulenger, 1896 2 0 Southwestern grass snakes Western Australia. Elapsoidea Bocage, 1866 10 7 African or Venomous Garter snakes (unrelated to North American non-venomous Garter Snakes) Senegal, South Africa, Mozambique, Namibia, Botswana, Zimbabwe, Swaziland, Gambia, Angola, Benin, Burkina Faso, Cameroon, Central African Republic, Chad, Ghana, Ivory Coast, Malawi, Mali, Mauritania, Niger, Nigeria, Uganda, Senegal, Sudan, Tanzania, Togo, Democratic Republic of the Congo, Congo, Zambia, Kenya, north Burundi, Rwanda, Ethiopia, Uganda, Somalia. Emydocephalus Krefft, 1869 2 0 Turtlehead sea snakes The coasts of Timor (Indonesian sea), New Caledonia, Australia (North Territory, Queensland, West Australia), and in the Southeast Asian Sea along the coasts of China, Taiwan, Japan, and the Ryukyu Island. SE Asian Sea (Pakistan, India, Bangladesh, Myanmar, Thailand, Vietnam), Australia (North Territory, Queensland), New Guinea and Papua New Guinea. Ephalophis M.A. Smith, 1931 1 0 Grey's mudsnake North-western Australia. Furina Duméril, 1853 3 0 Pale-naped snakes Mainland Australia. Glyphodon Günther, 1858 2 0 Brown-headed snakes Australia (Queensland), New Guinea. Hemachatus Fleming, 1822 1 0 Spitting cobra South Africa, Zimbabwe, Lesotho, Swaziland. Hemiaspis Fitzinger, 1861 2 0 Swamp snakes Eastern Australia (New South Wales, Queensland). Hemibungarus Peters, 1862 1 2 Asian coral snakes Taiwan, Japan (Ryukyu Islands). Homoroselaps Jan, 1858 2 0 Harlequin snakes South Africa. Hoplocephalus Wagler, 1830 3 0 Broad-headed snakes Eastern Australia (New South Wales, Queensland). Hydrelaps Boulenger, 1896 1 0 Port Darwin mudsnake Northern Australia, southern New Guinea. Hydrophis Latreille In Sonnini & Latreille, 1801 34 3 Sea snakes Indoaustralian and Southeast Asian waters. Kerilia Gray, 1849 1 0 Jerdon's sea snake Southeast Asian waters. Kolpophis M.A. Smith, 1926 1 0 Bighead sea snake Indian Ocean. Lapemis Gray, 1835 1 1 Shaw's sea snake Persian Gulf to Indian Ocean, South China Sea, Indo-Australian archipelago and the western Pacific. Laticauda Laurenti, 1768 5 0 Sea kraits Southeast Asian and Indoaustralian waters. Leptomicrurus Schmidt, 1937 4 2 Blackback coral snake Northern South America. Loveridgelaps McDowell, 1970 1 0 Solomons small-eyed snake Solomon Islands. Micropechis Boulenger, 1896 1 0 New Guinea small-eyed snake New Guinea. Micruroides Schmidt, 1928 1 2 Western coral snakes USA (Arizona, SW New Mexico), Mexico (Sonora, Sinaloa). Micrurus Wagler, 1824 69 54 Coral snakes southern North America, South America. Naja Laurenti, 1768 20 5 Cobras Africa, Asia. Notechis Boulenger, 1896 2 0 Tiger snakes Southern Australia, including many offshore islands. Ogmodon Peters, 1864 1 0 Bola Fiji. Ophiophagus Günther, 1864 1 0 King cobra Bangladesh, Myanmar, Cambodia, China, India, Andaman Islands, Indonesia, Laos, Thailand, Vietnam, west Malaysia, Philippines. Oxyuranus Kinghorn, 1923 2 2 Taipans Australia, New Guinea. Parahydrophis Burger & Natsuno, 1974 1 0 Northern mangrove sea snake Northern Australia, southern New Guinea. Paranaja Loveridge, 1944 1 2 Many-banded snakes West/central Democratic Republic of the Congo, Congo, Cameroon. Parapistocalamus Roux, 1934 1 0 Hediger's snake Bougainville Island, Solomons. Paroplocephalus Keogh, Scott and Scanlon, 2000 1 0 Lake Cronin snake Western Australia. Pelamis Daudin, 1803 1 0 Yellow-bellied sea snake Indian and Pacific Oceans. Praescutata Wall, 1921 1 0 Persian Gulf, Indian Ocean, South Chinese Sea northeast to coastal region of Fujian and Strait of Taiwan. Pseudechis Wagler, 1830 7 0 Black snakes (and king brown) Australia. Pseudohaje Günther, 1858 2 0 Forest cobras Angola, Burundi, Cameroon, Central African Republic, Democratic Republic of the Congo, Congo, Gabon, Ghana, Kenya, Nigeria, Rwanda, Uganda, Sierra Leone, Liberia, Ivory Coast, Togo, Nigeria. Pseudonaja Günther, 1858 8 2 Venomous brown snakes (and dugites) Australia. Rhinoplocephalus Müller, 1885 6 0 Australian Small-eyed snakes Southern and eastern Australia, southern New Guinea. Salomonelaps McDowell, 1970 1 0 Solomons coral snake Solomon Islands. Simoselaps Jan, 1859 13 3 Australian coral snakes Mainland Australia. Sinomicrurus Slowinski et al., 2001 5 4 India, Myanmar, Vietnam, China, Taiwan, Japan. Suta Worrell, 1961 10 2 Hooded snakes (and Curl Snake) Australia. Thalassophis P. Schmidt, 1852 1 0 Anomalous sea snake South Chinese Sea (Malaysia, Gulf of Thailand), Indian Ocean (Sumatra, Java, Borneo). Toxicocalamus Boulenger, 1896 9 0 New Guinea Forest snakes New Guinea (and nearby islands). Tropidechis Günther, 1863 2 0 Rough-scaled snake Eastern Australia. Vermicella Gray In Günther, 1858 5 0 Bandy-bandies Australia. Walterinnesia Lataste, 1887 1 0 Black desert cobra Egypt, Israel, Lebanon, Syria, Jordan, Iraq, Iran, Kuwait, Saudi Arabia. * Not including the nominate subspecies (typical form). The table above lists all of the elapid genera and no subfamilies. In the past, many subfamilies were recognized, or have been suggested for the Elapidae, including the Elapinae, Hydrophiinae (sea snakes), Micrurinae (coral snakes), Acanthophiinae (Australian elapids), and the Laticaudinae (sea kraits). Currently, none are universally recognized. There is now good molecular evidence for reciprocal monophyly of two groups: The African, Asian, and New World Elapinae, and Australasian and marine Hydrophiinae. Thus, the Australian terrestrial elapids are "hydrophiines," though not sea snakes, while it is believed that Laticauda and the "true sea snakes" evolved separately from among the Australasian land-snakes. Asian cobras, coral snakes, and American coral snakes also appear to be monophyletic, while African cobras do not (Slowinski and Keogh 2000). The type genus for the Elapidae was originally Elaps, but that group was moved to another family. In contrast to what usually happens in botany, the Elapidae family was not renamed. In the meantime, Elaps was renamed Homoroselaps and moved back to the Elapidae. However, Nagy et al. (2005) regard it as a sister taxon to Atractaspis which should therefore have been assigned to the Atractaspididae. ↑ 3.0 3.1 3.2 3.3 Cyberlizard (2007). Cyberlizard. 2007. The Hydrophiidae. Cyberlizard. Retrieved July 28, 2008. Integrated Taxonomic Information System (ITIS). 2004. Elapidae F. Boie, 1827. ITIS Taxonomic Serial No. : 174348. Retrieved July 26, 2008. Keogh, J.S. 2004. Elapidae. In B. Grzimek, D.G. Kleiman, V. Geist, and M.C. McDade, (eds.). Grzimek's Animal Life Encyclopedia. Detroit: Thomson-Gale. ISBN 0787657883. McDiarmid, R.W., J.A. Campbell, and T. Touré. 1999. Snake Species of the World: A Taxonomic and Geographic Reference, Vol. 1. Herpetologists' League. ISBN 1893777014. Nagy, Z.T., N. Vidal, M. Vences, W.R. Branch, O.S.G. Pauwels, M. Wink, and U. Joger. 2005. Molecular systematics of African Colubroidea (Squamata: Serpentes). In B.A. Huber, B.J. Sinclair, and K.-H. Lampe (eds.). African Biodiversity: Molecules, Organisms, Ecosystems. New York: Springer. ISBN 0387243151. Slowinski, J.B., and J.S. Keogh. 2000. Phylogenetic relationships of elapid snakes based on cytochrome b mtDNA sequences. Molecular Phylogenetics and Evolution 15(1): 157–164. Retrieved July 28, 2008. Uetz, P. 2008. Family Elapidae (cobras, coral snakes, and seasnakes etc.). TIGR Reptile Database. Retrieved July 28, 2008. This page was last modified on 10 January 2009, at 00:04.